In 2010 Kevin Lee Burton (Swampy Cree) and Caroline Monnet (Algonquin) unveiled RESERVE(d) to the Winnipeg arts scene. 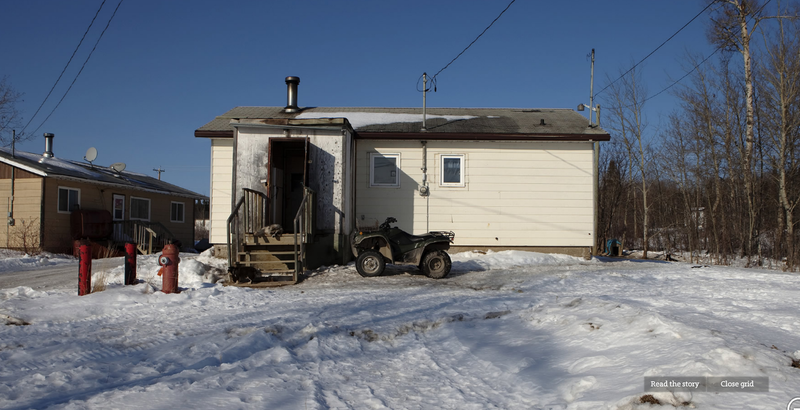 RESERVE(d) welcomed “northern” guests into the homes of the residents of God’s Lake Narrows, a remote, Indigenous community 550km outside of Winnipeg (only accessible by plane or boat and only then during good weather conditions). The installation featured film, sound, photography, and archival images of Burton’s grandmother organized so as to create an “intimate community” out of the Urban Shaman Gallery in which visitors could experience a “reserve reality” (Burton) that was otherwise largely inaccessible. In their forms and aesthetic, God’s Lake Narrows and RESERVE(d) are structured around a principle of hospitality: “the act or practice of being hospitable; the reception and entertainment of guests, visitors, or strangers, with liberality and goodwill” (OED). Both pieces welcome a variety of guests, the other, the stranger, the settler and the community member into the intimate and vulnerable space of the reserve home and provide a door to the lives of GLN residents. As a guest, the viewer is received by the artist’s friends and family, entertained by music and warmed by conversation. However, inasmuch as Burton’s piece is about visitors and welcome it is also about risk and bad house guests. 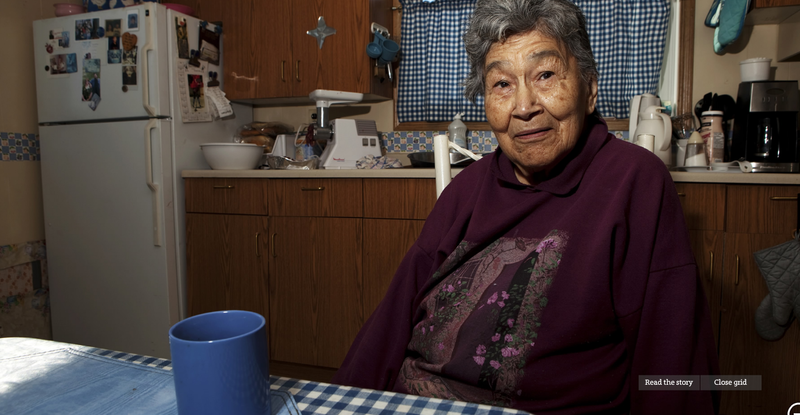 In Cree, hospitality translates into miyototakewin (Alberta Elders Cree Dictionary) which means, more literally, “happy to welcome guests” or “the act of paying tribute to someone by performing an act of kindness; a tribute.” Etymologically miyototakewin is similar to miyototamowin: “A benevolent action,” and miyotehewin “kind heartedness,” illustrating the ways in which hospitality and moral action are linked in the language. Fur trader narratives are filled with stories of miyototakewin, be it in sharing traplines or in providing food and shelter for unprepared “explorers.” Indigenous authors such as Cree poet Louise Bernice Halfe have also used the idea “welcome” to unpack early settler/Indigenous relations (Blue Marrow). As Gideon Baker puts it “reflection on hospitality furthers our understanding of the place of the stranger, specifically the welcome of the stranger” (1)–to which we can rightly add the settler colonialist. The intersubjective inversion between guest and settler that Newlove outlines here is a deep and problematic trope in settler colonial literature, which provides the opportunity for the settler to become Native (think “our home and Native land”). The colonial hostis destabilizes the boundaries between guest and host and makes them susceptible to exploitation. On the one hand, First Nations are represented as hosts when it benefits state appearances (thinking specifically of the Vancouver Olympics, or even the international airport at YVR), but they are also subject to the “hospitality” of Canada when it comes to matters of education, health and economics (healthcare, reservations, residential schools, etc. Attawapaskat is particularly salient example here). Imagine a keeping house located on reserve land (including urban reserves) that is managed by Aboriginal people and only open to Native people of that territory. That would be an irreconcilable space of Aboriginally. Now picture the same space, but open to any respectful person that would be an Aboriginal sovereign display territory. God’s Lake Narrows is an Aboriginal sovereign display territory. As Burton is well aware, hospitality and colonialism are historically linked and, for good reason, Indigenous communities are especially cautious of visitors. As he makes clear, reserves like GLN often feel “like closed communities” to outsiders, not only because of geography, but because the inhabitants are rightly suspicious of outsiders: “it’s a protective thing/what do you expect from a people that have a history of displacement and removal?” (GLN). Thus, inasmuch as God’s Lake Narrows and RESERVE(d) are about establishing the ground to reintroduce Indigenous hospitality into settler/Indigenous relations (a topic that has been at least partially obscured by settler colonialism), what is at stake for Burton is not only providing guests access to GLN, but establishing the means to protect Indigenous hosts against the threat that those guests represent in a digital space. 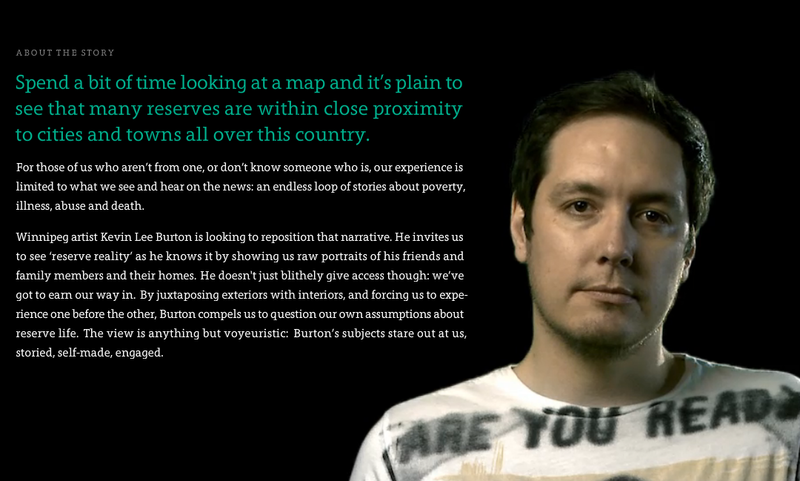 In what follows, I would like to illustrate how Burton uses GLN to outline some of the cultural code and protocols of Indigenous hospitality in cyberspace, paying particular attention to the ways in which the artist reestablishes the terms on which guest/host relations are articulated in Indigenous spaces online. God’s Lake Narrows is a series of 26 slides, alternating between photographs and text, which the viewer navigates by clicking on navigational arrows embedded into each page. The first half of the piece is composed of individual shots of house exteriors, taken from just beyond the threshold of the yards. There is no human activity in any of these slides, drawing the focus squarely to the small, makeshift homes themselves, homes which, as the accompanying text points out, are often just beyond third-world conditions. Accompanying the photographs and text is a muffled sound loop featuring a collage of local noises designed by Winnpeg musician Christine Fellows: voices on a CB radio, a bingo caller, and the crunch of feet walking in the snow are layered beneath the steady drone of a telephone dialtone. The sound college, along with the unpopulated shots and mounds of snow that make up the remainder of the scenery, fosters a sense of disconnection in the audience (hence the dialtone) and affirms the viewer’s initial position in the reserve as outsider. The second half of the piece however (beginning at slide 13), moves the viewer out of the cold and inside the homes they were just considering, welcoming them into the family setting. As the perspective changes from exterior to interior, so does the music. The same voices speak out to the audience, but where words were buried and muffled before they are now clear and resonant, supported by cheerful banjo and guitar. The clarity of voices and the warmth of the music, held in contrast to the first half of the piece, contributes to a sense of being “inside” and included in the families represented. Crossing the threshold at slide 13, the audience is put face-to-face with children, grandparents, mothers and fathers and allowed access to some of the most intimate spaces of family life. Met by smiling faces that look directly into the camera, guests are welcomed into bed and living rooms and made privy to the cramped conditions and homey clutter of undersized domiciles. Coffee cups, televisions and playing children make up the mise-en-scene of the slides that now reflect warmth and welcome in direct contrast to the lonely exteriors that preceded them. What is at stake in the act of welcoming that Burton unfolds is largely the audience takeaway. As identified in the third slide of the website, Burton is concerned with the casualness with which settler visitors pass through his home: “the only people that go casually through God’s Lake / are here to fill White People’s jobs: nurses / teachers, police, conservation officers.” In Burton’s conception, the casual visitor is the guest without a material stake in the home; he/she is the guest who does not have to worry about the long-term effects of his/her actions on the environment and its people and is thus disconnected–to evoke the dialtone once more–from the land and community. Cyberspace scholar Lisa Nakamura identifies the the threat of the casual guest as an effect of Internet tourism and the guest “who engages in a superficial, reversible, recreational play at otherness, a person who is satisfied with an episodic experience” in the space of the other. The casual visitor is made even more prevalent—and more casual—in the anonymity of the web: often a faceless, nameless interaction that provides the “guest” with the opportunity to inflict violence on the “home” (as in the troll phenomenon) or even to take on the role of the host (as with the often romanticized “hacker”). If you Google God’s Lake, you’ll find photomontages of pristine forests and lakes. You’ll also find videos of kids lip-synching to Lady Gaga, drinking, hickey giving, and other antics… I wish they’d take some of the videos down. I feel like they’re misrepresenting my hometown, or at least supporting the age-old prejudice of reserves as desolate places—nothing but a cesspool of Indians. As these slides help to illustrate, the difficulty with cyberspace as it applies to Indigenous studies is that while it can provide access to isolated communities and improve representation in a larger aesthetic/political field, it often does so in a way that elides nuance and alienates viewers from real the complexities of “reserve reality.” Ultimately, as far as Burton is concerned, if the Internet welcomed visitors to God’s Lake Narrows before his interactive website, it did so only under colonial prepositions, paradoxically closing the door to a more involved understanding of First Nations’ life. Still, while it engages with the discourse of critique, God’s Lake Narrows is not simply an account of Indigenous digital representation and the problem of hospitality. Rather, it is in the way in that the website is structured around invitation and welcome that it becomes a space to establish a discourse of hospitality outside of the overdetermined spaces of settler colonial ownership. Engaging cyberspace as a space of welcome, thus working within a unique discourse of “homes” “domiciles” and “hosts,” Burton is given the freedom to establish cultural codes and protocols that work to protect Indigenous communities and their position as host while remaining open to visitors. It is to these codes and protocols that I would like to turn to in the final paragraphs of this blog post. First, the most important thing to take note of is how GLN compels site visitors to engage with Indigenous history and culture. In order to cross the threshold, the viewer must first contend with some basic knowledge about the history of God’s Lake and the effects of settler colonialism on Indigenous peoples in Canada (such as the impacts of residential schools and the ongoing problem of government funding and its fallouts ). Of course, a viewer can skip through the textual slides (Burton has given them this power by putting site navigation in their hands), but many of the statistics and facts he presents fade in slowly and deliberately and often slides cannot be advanced until the entirety of the text is laid out, thus compelling the reader to process the information. In positioning the “facts” before the interior shots, access is precipitated by education. 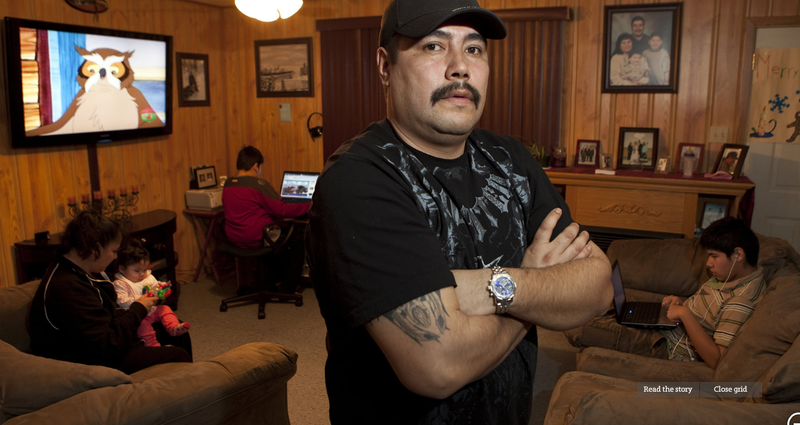 The viewer is asked to engage with the basics of Indigenous life in Canada before they are allowed to enter a home. Second, in terms of form, Burton makes his audiences active participants in the creation of God’s Lake Narrows by giving them limited control over the progress and direction of the piece. Burton employs what Jay Bolter and Richard Grusin call “situated viewing:” “comparing our place to other places we might possibly occupy” while denying the viewer the opportunity to cross into the frame. Allowing guests to dictate their movement through these homes, moving in and out as they please, allows for the “liberality” of hospitality, but it also ensures that rather than passively consuming media, the viewer is made to participate in its development. According to Jay Bolter and Richard Grusin, the “freedom to move through embodied space or cyberspace can be the freedom to lay claim to physical and intellectual territory”. However, active (yet administered) engagement makes the encounter in Burton’s piece less casual and gives the audience a small stake in the piece and the community it represents without forfeiting the role of host as guide. Guests are allowed to explore the territory Burton lays out, but God’s Lake Narrows remains a sovereign space. the accuracy of locations inferred from network information varies, but it can be startlingly accurate. When I started testing this feature, I was surprised by just how narrowly my location was reported. In fact, it was so accurate, that I have substituted the location of the Empire State Building in the screenshots—with the real location information (derived from my nearby Wi-Fi networks) you can easily find my house and see photos of my car on the driveway. Scary stuff. Loading screen for God’s Lake Narrows. Each blue dot represents a reserve in Canada. While most web designs only provide IP information available to the host, Burton makes geolocation an explicit part of his website, thus restructuring the systems of knowledge the delineate guest and host in a colonial framework of hospitality (i.e. the guest is given access to the ways in which the host views him/her). This is not to say that Burton “deconstructs” hospitality, but rather that he privileges the exchange of knowledge as the obligation and right of the host (as opposed to using the knowledges as a means of surveillance and control). What hospitality is, in this sense, is thus contingent on the host’s responsibility to reflect the guest’s position as such and to position him/her as guest in relation to Indigenous space. Indeed, not only do his subjects necessitate engagement, but the artist also makes an appearance in the piece, turning his filmic gaze on the audience and making them a part of the piece’s observation. After clicking the “About God’s Lake Narrows” tab, the audience is confronted with a looped video clip of the filmmaker staring out at him/her through the screen. By placing the audience in the position of subject, Burton expands the boundaries of the piece, facilitating its ability to welcome the audience inside GLN as guest. While the host’s visage is warm and friendly, it is clear in the way that the gaze is inverted that even this supplemental portion of the website necessitates a critical engagement between guest and host. This is made clear not only in the gaze itself (which, in its repetition is somewhat disconcerting) but also in the semiotics of the video loop. The shirt Burton is wearing reads “are you ready?”, which can, on the one hand, be read as an interrogative challenge to the viewer’s status as guest. (Are you ready to come into my home? Are you ready for this encounter with the other? Are you ready to shift you perspective?). However, the framing of the loop makes the “y” of “ready” difficult to see, transforming the interrogative from a question about inclination to a question about knowledge and familiarity. “Are you read?” puts the viewers’ epistemology at stake, not only asking if they are familiar with the history of Indigenous peoples in Canada (have you done your homework), but how they garnered that information (i.e. through written histories, as opposed to community interaction or oral history). “Are you read?” also refers to the information page itself, which Burton is standing guard over here, asking, do you know the history of this place? Are you using the information provided to facilitate your consumption of the art? Read homophonically, the shirt also reads “are you red?” or, put differently, are you Indigenous?, an interrogative which, much like geolocation, positions the viewer in relation to the piece, albeit this time from the perspective of race. “Are you red?” asks the viewer to position him/herself in relationship to the piece, to begin by addressing the fundamental question of guest/host and considering how it affects one’s relationship to the piece. This is particularly important in cyberspace, where, as Nakamura has illustrated, a “default whiteness” pervades, enforced by the taboo of querying race. The semiotics of this “About” loop compel its audience to question how their own subjectivity produces “information” about GLN. Burton’s hospitality is thus connected to his guests’ ability to locate themselves as such in “Native land” (a la Newlove). 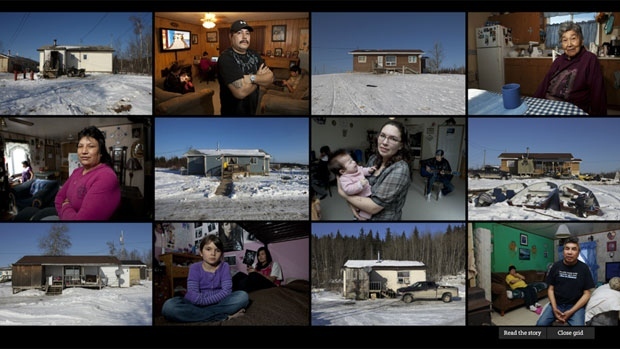 While conceived digitally, the model of Indigenous hospitality outlined by Burton in God’s Lake Narrows can provide a roadmap for the colonial guest in an analogue “home.” What is at stake in God’s Lake Narrows is a reclamation of the position of host for Indigenous peoples—a definition that colonialism has worked to undo at the expense of Indigenous culture and politics. However, the goal is not to reaffirm Western conceptions of the guest/host binary. Entering the website compels viewers to position themselves as guest and to acknowledge that their tenancy in Indigenous space is possible only under the welcome of the host. However, maintaining Indigenous representation as host is not just a matter of surveillance. Indigenous hospitality functions on the basis of miyototamowin (benevolence); it provides for a warm welcome, intercultural exchange and freedom of movement. It seeks not to regulate the guest (which would be a reiteration of the settler colonial model), but to make them contentious participants (as opposed to occupants) in the home. In this sense, Indigenous hospitality is not a reproducible ideology (something that could be written into a book of etiquette), but means of reconceptualizing the relationship between settler/guest and Indigenous/host. The interactive website, particularly when read against its initial iteration in the Urban Shaman, provides a unique space to re-establish Indigenous hospitality and a distinctive form to engage the viewer/guest in defining its limits outside of its “analogue” representation.